Disney has brought to the screen in spectacular fashion another treasured story. Recognizable talents do an amazing job in bringing the characters to life. It's the beginning of the summer and you need something for your children to do. At the right time the perfect movie has arrived. A Wrinkle In Time makes its appearance to entertain your children as well as the child within all adults. Madeleine L'Engle's tale of science intermingled with family values translated to the screen comes with it a heroine that your children can relate to. Young Meg Murry (Storm Reid; 12 Years A Slave), has trouble with mean girls and fitting in at middle school. She has a little brother, Charles Wallace (Deric McCabe; Hold On), who is understandably misunderstood and bullied because he is intellectually far above average. Meg has been having difficulty accepting the disappearance of her father four years ago during a science experiment. Her Mom (Gugu Mbatha-Raw; Belle) also a scientist has not understood how to make it easier for her. Her little brother barely remembers their Dad (Chris Pine; Star Trek: Beyond). Into this mix come three whimsical creatures…Mrs. Whatsit (Reese Witherspoon; Walk the Line), Mrs. Who (Mindy Kaling; The Office) and Mrs. Which (Oprah Winfrey; The Color Purple) to help not only Meg but the Universe. Meg is skeptical when meeting the magical ladies but Charles Wallace her brother trusts them implicitly. So begins the adventure and the search for Dr Alex Murry. This is a quest where the youngsters set out to find their Dad and attempt to save all of humanity in the process. Meg along with Charles Wallace and friend Calvin will take your children with them to a far away world brilliant with vivid colors and magical creatures. They travel on to Orion, another world, to ask advice of the Happy Medium (Zack Galifianakis) and learn the possibilities of doing nothing. They will travel together to the land of Camazotz, where the evil "IT" has Dr Murry hostage and will learn that love is truly the answer. Included in this Blu-ray release are hours of bonus material including deleted scenes, bloopers, All Star Cast Interviews including an up-close look at the making of this extraordinary film plus music videos, and audio commentary. The 1080p resolution and 2.40:1 aspect ratio gives this film an outstanding video quality. Colors are vibrant and radiate off the screen and the background scenery is crisp and beautiful. Black as deep and true. The DTS-HD Master Audio 7.1 is solid and clean. There is a nice balance between the dialogue and soundtrack. Disney has brought to the screen in spectacular fashion another treasured story. Recognizable talents do an amazing job in bringing the characters to life. An up and coming actress and a wonderful talent, Storm Reid holds her own with the likes of Oprah Winfrey and Reese Witherspoon. Your children will be entranced and their imaginations stimulated. More importantly they will realize there is nothing you can't accomplish when you have faith and confidence in yourself and release your fears. This is a magical ride from beginning to end. 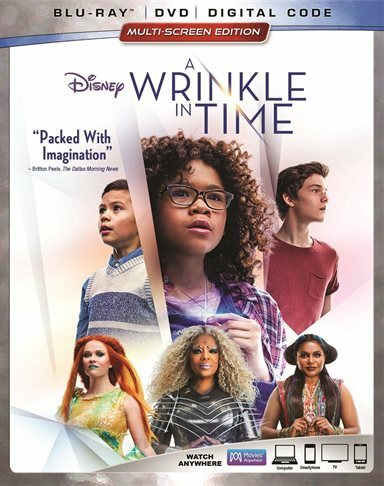 Download A Wrinkle in Time from the iTunes Store in Digial HD. For more information about A Wrinkle in Time visit the FlickDirect Movie Database.